Recently I rented a cabin in beautiful Anderson Valley, CA and did a little reading and a lot of sketching. It was a little spooky to walk past the cabin deck at night and see these sets of eyes (eye holes?) staring at me. But me 'n the trees rallied and I came home with good wood. 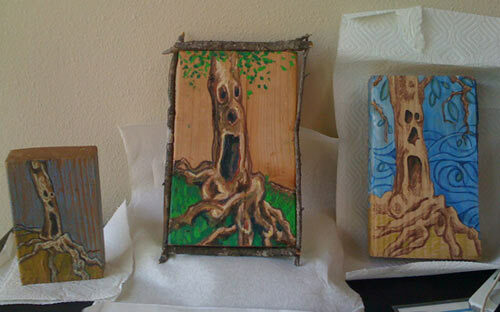 In addition to being inspired by the trees, I worked off Judaic sketches that I did awhile ago. My partner has wood blocks leftover from some lumber projects, so I've been playing around with those as the substrates.